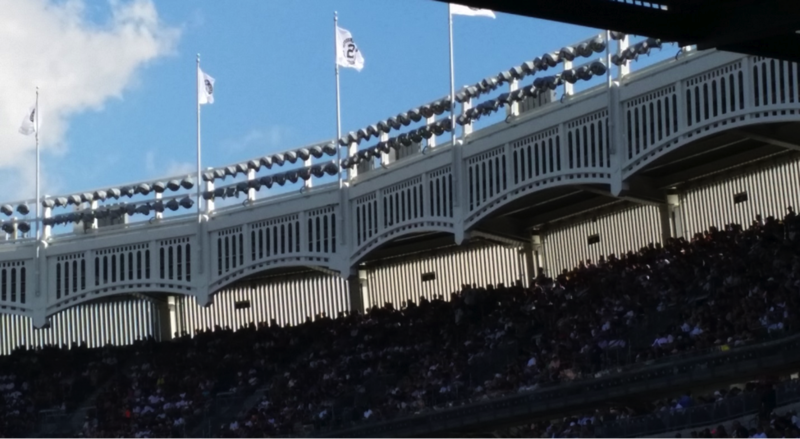 On the days at Yankee Stadium that feature only a moderate amount of brand-building pageantry, pennants representing each team hang from the building’s famous frieze, their placement corresponding to each club’s spot in the standings. The Yankees aren’t alone among major league teams in displaying the standings, but the flag system is one of the more ostentatious methods, well suited to a team that’s used to occupying the pole position. On Sunday, though, those pennants were gone. 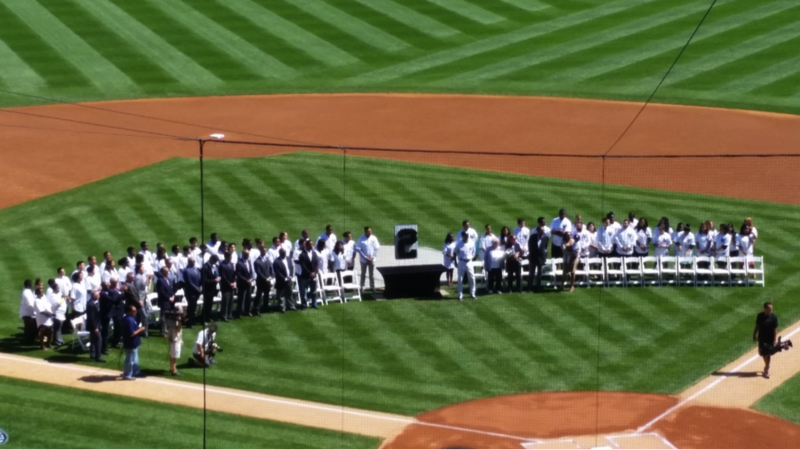 In their place waved white flags, all of them bearing the insignia of Derek Jeter’s final season. This season has seemed like an endless succession of Derek Jeter days, so it was fitting that those flags would wipe away any evidence of wins and losses. On the road, Jeter’s opponents give him gifts as rival fans roar approval, and at home, camera phones flash as rooters try to record the last uniformed movements they’ll see him make. On Sunday, though, the event was official; not a Derek Jeter day, but the Derek Jeter Day. And not at the typical time of the year, but on September 7, with weeks to go. 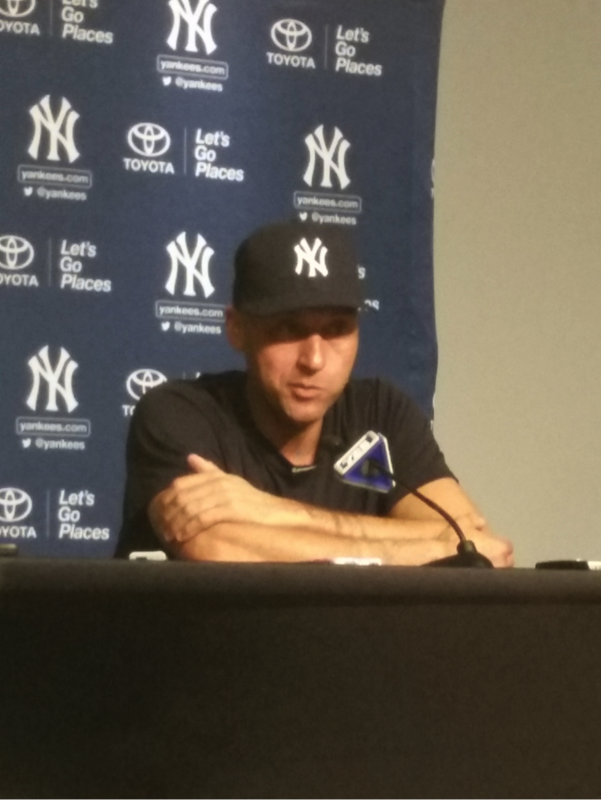 “It was very strange,” Jeter said of the midseason hosannas, dwelling on the difficulty of simultaneously taking his bows and mentally preparing for an important game. The Yankees will almost certainly choreograph another sendoff on September 25, Jeter’s final home game, and because the season ends on the road, they’ll probably retire his number in a separate ceremony, most likely at some point next season. By that point, one would think, the fan base will be suffering from farewell fatigue. From the franchise’s perspective, though, the Jeter farewell fest and the departure of Mariano Rivera (who retirement-toured in 2013) couldn’t have come at a better time. 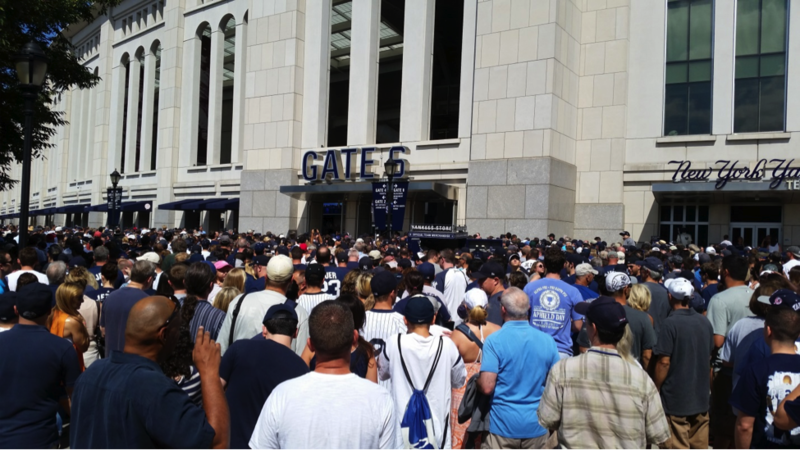 Because Yankees fans expect their team to succeed every season, they’re particularly prone to tuning out when the club fails to make the playoffs, as it’s in danger of doing for the second straight year. So if the standings are scary, why not hide them, hoist the white flags, and hope the masses will pay to relive the past? The Yankees seem to have learned something from Brandon Steiner, CEO of Steiner Sports Marketing, who has turned every Yankees-associated item into a revenue source: There’s a market for more than one big good-bye. According to every win-value metric, Jeter has been below replacement level from 2013 to 2014, so even if you’re not concerned about the Steinbrenners’ bottom line, it’s hard to begrudge the Bombers the attempt to recoup their investment. Some of Jeter’s friends are as beloved in the Bronx as he is (if not as exalted). One by one, they waved their way across the baseline: Joe Torre, Tino Martinez, David Cone, Paul O’Neill, Bernie Williams, Jorge Posada, Rivera (Andy Pettitte was elk hunting), Reggie Jackson, Hideki Matsui, Tim Raines, Dave Winfield, Cal Ripken Jr., and even Michael Jordan joined Jeter, all of them introduced by emcees John Sterling and Michael Kay, the former radio partners whom the YES Network separated shortly before the FCC would have had to step in to prevent their combined pomposity from overloading the airwaves. The program emphasized the shortstop’s status as a transcendent star. Jeter isn’t just the Yankees’ captain, the emcees suggested, but the captain of all of baseball — and there was Bryce Harper, perhaps the future “face of baseball,” to say so in one of many video tributes that flashed on the big board between innings. Jeter isn’t just a Yankees legend, but a New York City one — and there was a proclamation from Mayor Bill de Blasio to prove it. Jeter isn’t just of this world, but of the heavens — and right on cue came a trio of astronauts, floating in formation and tipping their caps. “BOY, ISN’T THIS GREAT?” thundered Sterling mid-ceremony, reading straight from a script that built in more pauses for applause than a State of the Union address. Flanked by the assembled sports luminaries and “Jeter’s Leaders” from his Turn 2 Foundation, Jeter accepted offerings from a series of Steinbrenners, then delivered a gracious and predictably bland 330-word speech, half of which he devoted to thanking the fans. Like Rivera, Jeter looks from afar much like he did in the mid-’90s, when (as a succession of his former teammates insisted on Sunday) he sprang forth from the minors as a fully formed leader programmed to Play the Right Way. Unlike 37-year-old Carlos Beltran, who’s grown thicker around the middle and moves like someone who needs surgery (he dropped a catchable ball on Sunday), the 40-year-old Jeter’s uniform still fits flatteringly over his athletic frame, and his slightly bowlegged swagger still looks assured. Up close, the signs of age are more obvious, but with his cap hiding both his receding hair line and the lines and bags beneath his eyes, one could still squint and see the face that inspired so many shrieks and sign-scrawled marriage proposals. It wasn’t to be, because unlike Rivera, who remained freakishly effective in his final season, Jeter has aged in the unseen ways that kill careers. Entering the game, 50 percent of deliveries 95 miles per hour or more to Jeter had resulted in swinging, fouled, or taken strikes; he had put 25 such pitches in play, and only five had gone for hits, all of them singles. Sunday’s matchup was a worst-case scenario for any hitter whose bat has slowed: Kansas City rookie Yordano Ventura, the hardest-throwing starter in the majors. With the Royals nursing a small lead in the Central, and the Yankees technically contending for the AL wild card that Kansas City might still have to settle for, there would be no pipe shots on Jeter Day. Ten of the 12 pitches Jeter saw in his three plate appearances against Ventura left the righty’s hand traveling 96 miles per hour or faster. In the first, Jeter hit a weak grounder that went for a single when it happened to bounce too deep in the hole for Alcides Escobar to complete the throw. Jeter walked in the third and struck out in the fifth. In the eighth, he made a fourth trip to the plate after Ventura was gone from the game, only to find himself facing Kelvin Herrera, the hardest-throwing reliever in the American League. Three more 98-mile-per-hour heaters produced another weak grounder, this one gobbled up by Mike Moustakas. The Yankees lost, 2-0, shut out for the fifth time in their last 26 games. Jeter has earned criticism for being too competitive or prideful to volunteer to move to a less demanding defensive position or a less important lineup slot.2 However, he did agree to make himself a spectacle, which for him was a sacrifice of a different sort. 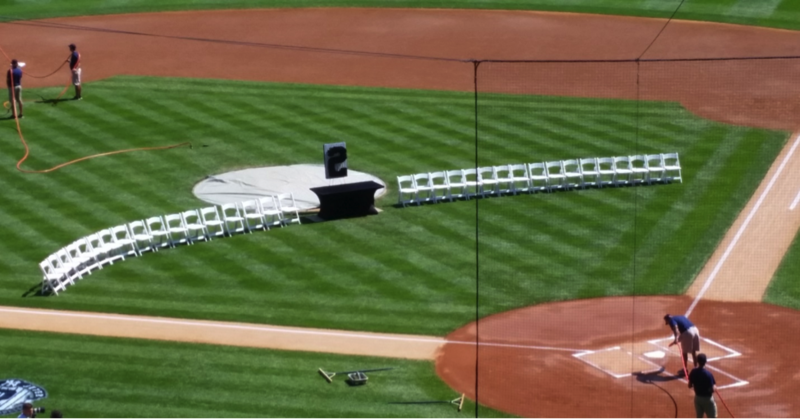 “[Jeter] didn’t want anyone telling him nice going,” Torre said in a tribute video. Cone, on the YES broadcast, mentioned that Jeter had to be talked into the farewell tour. Jeter could have walked away more quietly, but he acquiesced to the exit that would benefit both the Steinbrenners and the fans. After the game, as before, I mechanically held my recorder aloft in the press room, capturing every piece of praise. I’ll spare you the transcriptions. Fed the same softball questions, the panelists turned Jeterating into a competitive sport, searching for a way to rearrange the same keywords (class, legacy, professional, Captain, leader, example, winner) into a new enough sequence to constitute an original answer. 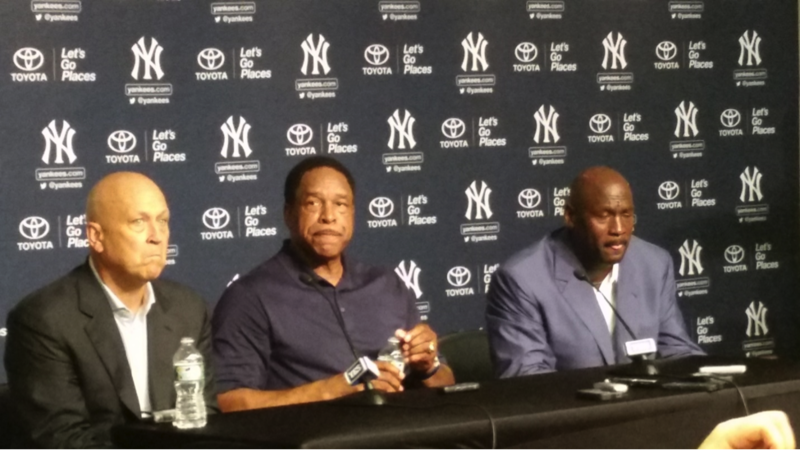 Their words made the real Jeter seem less embraceable than the giant Jeter banner in the Great Hall. The on-field ceremony and the press conferences weren’t intended to humanize him — his play, perhaps, has done that more than most would like — but to cement his transition to sepia tone, to usher him into a second, even longer career as an iconic ambassador who can headline Old-Timers’ Days for decades to come. “He’s not going to get teary, but you can tell that got to him,” Posada said on the YES broadcast, and Jeter claimed that his hand had shaken as he held the mic. The emotions and the tremors aren’t evident on video. Maybe Jeter will start sobbing soon, like Rivera did last year, but on Sunday, he was too practiced and too polished for fans to see inside. Jeter converts questions to clichés as effortlessly as he used to flick inside pitches to right, but as good as he is at being boring,3 he has a quick wit and a puckish side that the public doesn’t often see. In the midst of answering an umpteenth question about Yankees fans, Jeter interrupted himself: “Someone’s phone’s ringing,” he said, reaching for a vibrating phone on the table in front of him, where the assembled reporters had left their recording devices. He read the name on the display. “Walt [redacted].” The phone’s owner apologized for the interruption and told Jeter that he could put the phone back down. Instead, he answered it. “Hey Walt, she’ll have to call you back, buddy,” he said. For the first time, laughter replaced reverence. Jeter takes the games seriously, but after 20 years at the center of the media maelstrom, he’s able to see the absurdity in everything else. That’s the side of Jeter I’ll miss, more than his admirable-but-alienating ability to avoid controversy by denying the public parts of himself. A few minutes later, mischievous Jeter emerged again, this time to force us to confront a future without him. “What role do you think you’ll have with the team next year?” another reporter asked. The reporter pushed. “I think you’ll be back here in some way,” she said. “You think so?” he asked. Always protective of his personal life, Jeter didn’t bestow field-seat status on girlfriend Hannah Davis. “I got a chance to be the shortstop for the New York Yankees, and there’s only one of those,” he said, protectively, like Gollum contemplating his Precious.